The House and Senate have respectively passed their versions of a 2018 Farm Bill and now a conference committee will attempt to work out differences. Both the House and Senate include versions of the Agricultural Risk Coverage at the County Level (ARC-CO) and Price Loss Coverage (PLC), two of the three commodity title programs available under the 2014 Farm Bill. The House version eliminates the third program— ARC at the individual farm level (ARC-IC) — while the Senate leaves it in. ARC-IC was selected for 0.9% of all base acres at the time of the 2014 farm bill sign up. Assuming that ARC-IC election remains low or does not exist, farmers and landowners will again choose between ARC-CO and PLC for each program crop on a Farm Service Agency (FSA) farm. 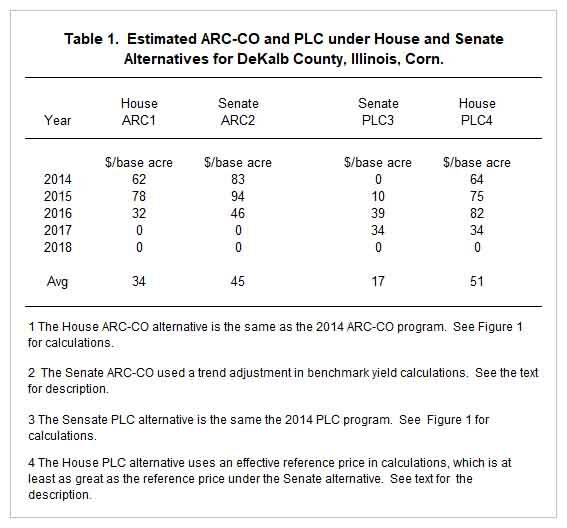 We compare the House and Senate versions of ARC-CO and PLC by first computing payments for the four alternatives for corn in DeKalb County, Illinois over the 2014 to 2018 crops. We also evaluate estimates of future outlays made by the Congressional Budget Office (CBO). From 2018 to 2022, the expected life of the 2018 Farm Bill, PLC under either the House or Senate versions is expected to make larger payments than either ARC-CO under the House or Senate versions. Unless the conference committee modifies ARC-CO to make its expected payments more equal to PLC, most corn base acres likely will be enrolled in PLC, a reverse of the 92% of acres enrolled in ARC-CO under the 2014 Farm Bill. Since the current ARC-CO and PLC program serves as the basis for all alternatives, we begin by describing payments for the 2014 program (for more detail, see farmdoc daily, February 20, 2014). 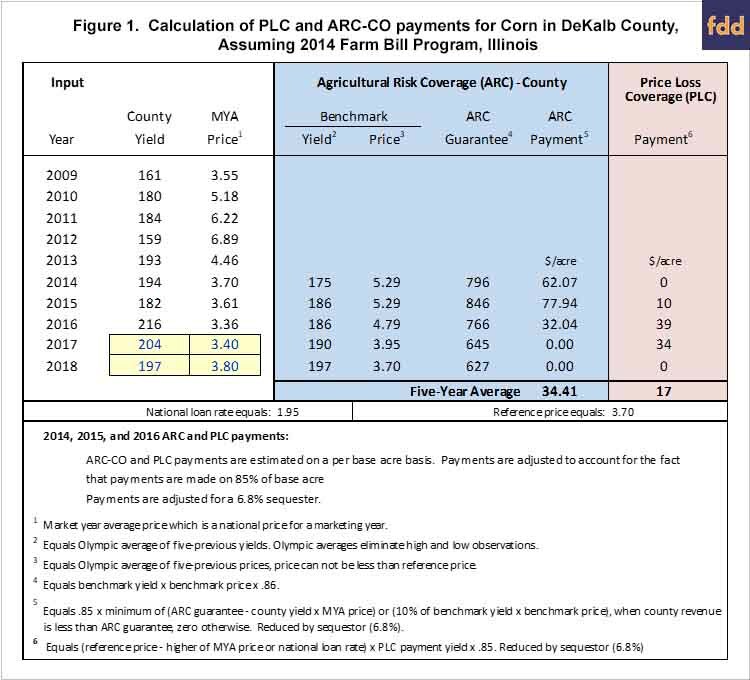 Figure 1 shows actual ARC-CO and PLC payments in 2014, 2015, and 2016 for a corn base acre in DeKalb County. Also shown are projections for 2017 payments, which will be received this October, and for 2018 payments, which will be received in October 2019. Prices since 2014 have been below $4.00, and the benchmark price has declined. The benchmark price will be $3.70 in 2018, compared with a high of $5.29 in 2014. The benchmark price cannot go below $3.70 since the $3.70 reference price is a floor on the benchmark price. The decline in the benchmark price has resulted in reductions in the ARC guarantee. The ARC guarantee reached its high in 2015 at $846 per base acre. The guarantee has decreased by $201 per acre to $645 in 2017. These declines in guarantees are much of the reason for ARC payments declining over time. ARC-CO payments for corn were $62 in 2013, $78 in 2015, and $32 in 2016. ARC-CO payments will be $0 in 2017 and likely will be $0 in 2018. The price values used for 2017 and 2018 are from the July 2018 WASDE. The yield for 2017 is the National Agricultural Statistics Service estimated yield. Yield for 2018 is assumed to equal the benchmark yield. The first estimate of field yield for 2018 will occur in the August 2018 crop production report. Price Loss Coverage (PLC) is a price program. It makes payments when prices are below the reference price ($3.70 for corn). Each FSA farm has a PLC yield. The yield used in calculating payments in Figure 1 is 145 yield, the average for DeKalb County, as reported by the Farm Service Agency. A per bushel shortfall is calculated when the MYA price is below the reference price equal to the reference price minus the higher of the MYA price or loan rate ($1.95 for corn). For example, the MYA price was $3.36 in 2016. Per bushel shortfall was $.34 ($3.70 reference price – $3.36 MYA Price), which is multiplied by the PLC yield and the payment acre factor of 0.85 and the sequester factor of (1 – 0.068). Table 1 shows historical payments for corn in DeKalb County for the House and Senate versions of ARC-CO and PLC. The House version of ARC-CO is the same as the 2014 ARC-CO program. Hence its payments are the same as those shown in Table 1 are the same as those in Figure 1. The benchmark yield will be trend adjusted. An actual yield below 75% of the t-yield will be replaced by 75% of the t-yield. Both of these modifications potential raise benchmark yields, benchmark guarantees, and ARC payments. For DeKalb County, none of the yields are below 75% of t-yield floor. Hence, the t-yield replacement does not increase benchmark yield in DeKalb County. The trend adjustment will increase DeKalb County’s benchmark yields. Exactly how FSA will implement the trend adjustment is unknown. For calculating payments in Table 1, the 2018 trend adjustment used by the Risk Management Agency was used to adjust historical yields upward. Because of the trend yield adjustment, the Senate ARC-CO version results in higher payments than the House version. Over the 2014 to 2018 period, the Senate version would have averaged payments of $45 per base acre, an $11 increase over the $35 per acre payment for the current House version of ARC-CO. Note that the Senate version does not have payments in 2017 and 2018, just as the House version does not. The two modifications do not counter the declines in the revenue guarantee, resulting in no payments in 2017 and 2018. The Senate PLC program is exactly the same as the 2014 PLC program. Hence the Senate PLC payments shown in Table 1 are exactly the same as in Figure 1. The House PLC version uses an effective reference price in calculating per bushel shortfalls. The effective reference price equals .85 times the Olympic, five-year average of MYA prices as long as that average is between the current reference price ($3.70 for corn) up to 1.15 times the reference price ($4.26 for corn). If the average is below the $3.70 reference price, the $3.70 reference price is used. If the average is above $4.26, the $4.26 price is used. The House PLC program always has an effective price that is at least as great as the Senate PLC program. Effective reference price is higher than the $3.70 reference price in the years from 2014 to 2016, resulting in larger payments. In 2014, for example, the House PLC program had a $64 payment versus a $0 payment under the Senate (and existing) program. Over the 2014 to 2018 period, the House PLC version is estimated to have paid $51 per acre, $34 higher than the Senate PLC version. Had it existed, the House PLC program would have made higher payments in DeKalb County than the two ARC-CO alternatives and would have made expectations of payments by ARC-CO and PLC at the time of the 2014 farm bill sign up much closer. Note that the House PLC version is projected to make no payment for the 2018 crop. The above analysis is historical illustrating the impacts of changes proposed by the House and Senate. Payments on the commodity programs moving forward are the concern as negotiations on the 2018 Farm Bill continue. The Congressional Budget Office (CBO) makes projections for commodity title programs using projected MYA prices. 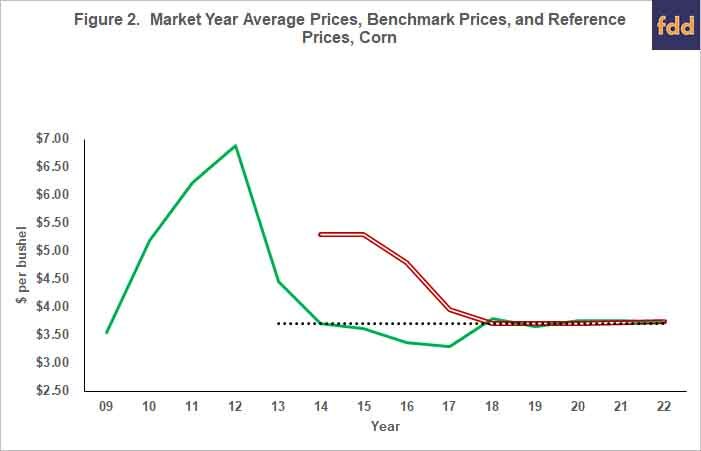 In their forecasts, CBO is using expected MYA prices for corn near the reference price of $3.70 per bushel for the years from 2019 to 2022 (see Figure 2). These CBO price forecasts result in a much different price environment than when the 2014 Farm Bill was passed. In 2014, the benchmark price for ARC was $5.29 per bushel, much higher than the $3.70 reference price (see Figure 2). The benchmark price was also higher than the actual MYA price. As a result, ARC-CO was expected and did make higher payments for corn than PLC in most cases across the United States. 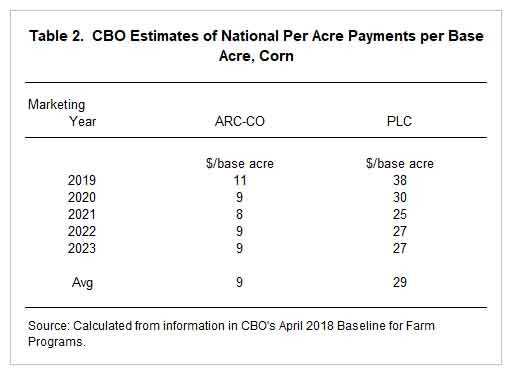 Projection made in its April 2018 baseline allows calculation of CBO’s projections of per acre ARC-CO and PLC payments. On a national per base acre basis, ARC-CO is expected to make payments of $11 per acre for corn produced in the 2019 marketing year (see Table 2). For the 2019 marketing year, PLC is projected to pay $38 per corn base acre. In each year of the projected life of the 2018 Farm Bill, PLC is projected to pay more than ARC-CO. Over the 2019 to 2023 period, PLC is projected to pay an average of $29 per corn base acre compared to $9 per corn base acre for ARC-CO. The Senate version of ARC-CO would result in higher payments for ARC-CO than those shown in Table 2 because the use of trend-adjusted yields and floors of 75% of t-yields will result in higher yield benchmarks and ARC guarantees. CBO’s estimate of program outlay changes for the Senate version suggest modest increases in spending of an average $20.5 million per year for marketing years from 2019 to 2023 (see Congressional Budget Office, Cost Estimates of S. 3042). The $20.5 million is applicable to all program crops. However, even if all the $20.5 million were applied to corn, expected payments would increase by $1.35 per corn base acre. This increase would leave expected payments for ARC-CO near $12 per base acre, still well below those for PLC. It is unlikely this increase would change any decisions by farmers as to which program to elect. Turning to PLC, the House alternative will have at least as high of payments as shown in Table 2 for the Senate version because the House version has the potential escalator provision for reference prices. CBO estimates the impacts of the effective reference price mechanism to be minor for corn, with PLC payments for corn increasing $5 million for the ten fiscal years from 2019 to 2028 (CBO, https://www.cbo.gov/system/files/115th-congress-2017-2018/costestimate/hr2.pdf). This $5 million total increase would work out to be less than an increase of $1 per corn base acre. The reason for this low estimate is that MYA prices are not expected to get high enough to cause the effective reference price to exceed the reference price. Given the choices in the House and Senate versions, most farmers and land owners would choose PLC over ARC-CO for use on corn base acre. This assumes that prices remain at levels currently forecast. It also assumes that farmers and land owners make choices based on highest expected payments from the program. Increasing the coverage level from .86 to a higher level. Increase the largest ARC-CO payment from 10% of benchmark revenue to a higher value. Increase the minimum price for the calculation of the benchmark price. Currently, the reference price is used when the MYA price is below the reference price. This floor price could be raised, thereby increasing the lowest benchmark price and the lowest revenue guarantee. Making modifications to ARC-CO seem justified. Creating a revenue program and price program with roughly the same expected payments would allow farmers to choose between a revenue and price program rather than making program choices based on expected payments. Coppess, J. and N. Paulson. "Agriculture Risk Coverage and Price Loss Coverage in the 2014 Farm Bill." farmdoc daily (4):32, Department of Agricultural and Consumer Economics, University of Illinois at Urbana-Champaign, February 20, 2014.